If you are not aware about how to download and install apache jmeter then you can read my previous post where i have described everything about jmeter installation process. In this post i have described how jmeter record your first software load test plan using jmeter proxy server. First of all, you need to change bellow given settings of Firefox browser for recording software load test script in apache jmeter. Open Tools -> Options -> Advanced tab -> Network tab -> Settings. It will open connections setting popup. Select "Manual Proxy Configuration" radio button. Now your browser connection settings will be looks like bellow. Start Jmeter tool by running jmeter.bat file. It will open apache jmeter GUI. Right click on "Test Plan" element and select Add -> Threads(Users) -> Thread Group. It will add "Thread Group" under "Test Plan". Right click on "WorkBench" element and select Add -> Non-Test Elements -> HTTP(S) Test Script Recorder. It will add "HTTP(S) Test Script Recorder" under "WorkBench". 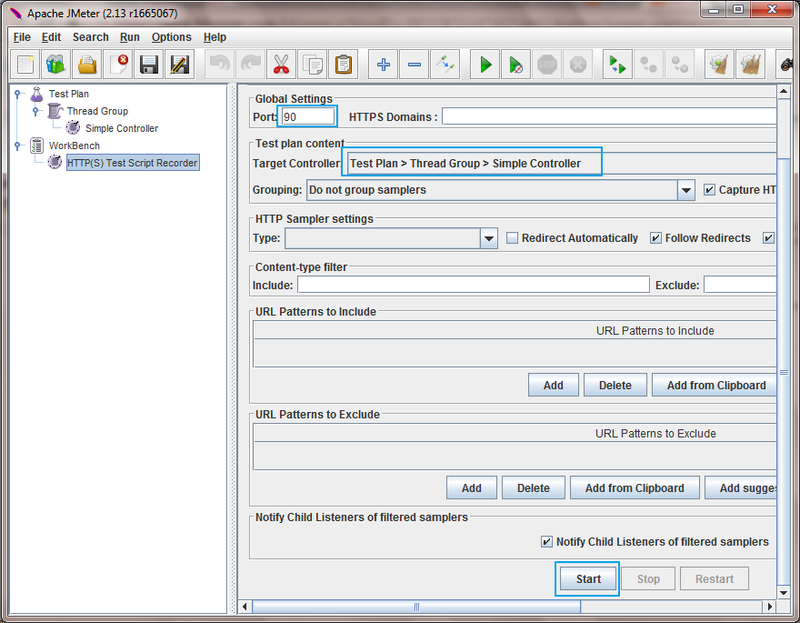 It will add jmeter proxy server in your test plan. Click on "HTTP(S) Test Script Recorder" element and Set Port = '90' and select Target Controller = Thread Group> Simple Controller. Now your jmeter proxy server's settings are done. 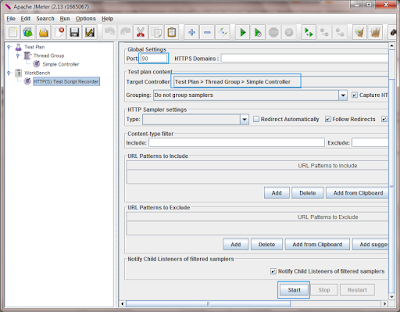 Now Your Jmeter GUI settings and other configurations will looks like bellow. If your all settings are correct as shown in above figure, you are ready for recording your first sample software load test plan script in apache jmeter. Click on "Start" button as shown in above image and then open your application URL in Firefox browser and perform required navigation on it. All your requests will be recorded under "Simple Controller" as bellow. Click here to read about Running Your First software load test plan Steps in apache jmeter. Platina community affairs provides training in various tools that can transform and help people to know their potential.Through our programs we expand the opportunities and help improve digital inclusion through the technology access and training. The information which you provides is very much useful for the Testing Tools Learners. Thank you for your valuable information. I found 123trainings is the best Testing Tools Online Traininginstitute in Hyderabad, India . Useful article, but you should remove localhost address from "No proxy for" field in browser settings to make JMeter record actions. Also, better exclude static files in JMeter Proxy server. Fantastic & brilliant article post, I was seeing for this information on Google while I found your testing tool information, unquestionably I like your post! I can't get HTTP Proxy Server in options. Hello, i also facing same problem as Karlien Neuhoff. and while proxy server selection i also selected option 'HTTP(s) Test Script Recorder'. but at the end getting error as "Root CA Certificate CN=do not install unless this is your certificate(JMeter Root CA),OU=UserName=admin"
Hello, is there any need to change proxy setting? You hav'nt explained why we are doing a specific step!